To celebrate the arrival of a new partner to their firm, CDC is launching the new brand image of Campeau-Vinet-Gauthier, Chartered Professional Accountants since 2000.The mandate was to design and present a strong and renewed visual identity, allowing the client to quickly establish itself in the accounting market in Quebec. In moving from Campeau-Vinet to Campeau-Vinet-Gauthier, the graphic reflection supporting the new brand image required a resolutely more modern and youthful touch than the previous logo, while also attempting to include the notion of financial health to present the firm's marketing positioning. 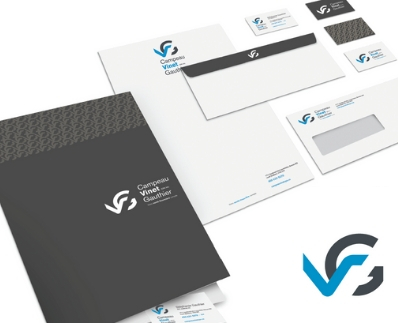 Through a search for comparables, supplemented by competitive research, CDC developed a visual platform comprising a logo, a slogan and its variations on stationery (user guide, business cards, envelopes, e-mail signature, presentation covers).